The River Room in downtown Wilmington, NC is one of the cities best known wedding and reception venues. Established in 2009 and capable of holding up to 120 occupants, the venue's quaint brick interior provides a warm and inviting setting for any event and is exceptional for weddings and receptions. It's views of the waterfront are exceptional, making it a great choice for watching the sunset during your reception. This is one of those images I to create for all of my brides that have me join them while they get ready. Made using only the sunlight coming through the large banks of windows directly across from her, I focus on the eye closest to me using my 85 and at a angle that will also capture some of the lips in focus. It's a creative image and not meant to be completely in focus. Timing the shot is the obvious challenge as I want the brush either touching the area of the lips in focus or having just been pulled off. Another smaller challenge is choosing an angle that minimizes the background distractions. Here, we have a large painting on the wall behind her as well as makeup products and tools on the counter. But because I chose a perfect angle, the painting doesn't show and you only get the slightest hint of the makeup behind her. I chose to change this image to black and white, but it is equally as beautiful in color, with the bride's eyes and lips adding a brilliant pop of color to the picture. I love the touch of anticipation the bride is has in her eyes. 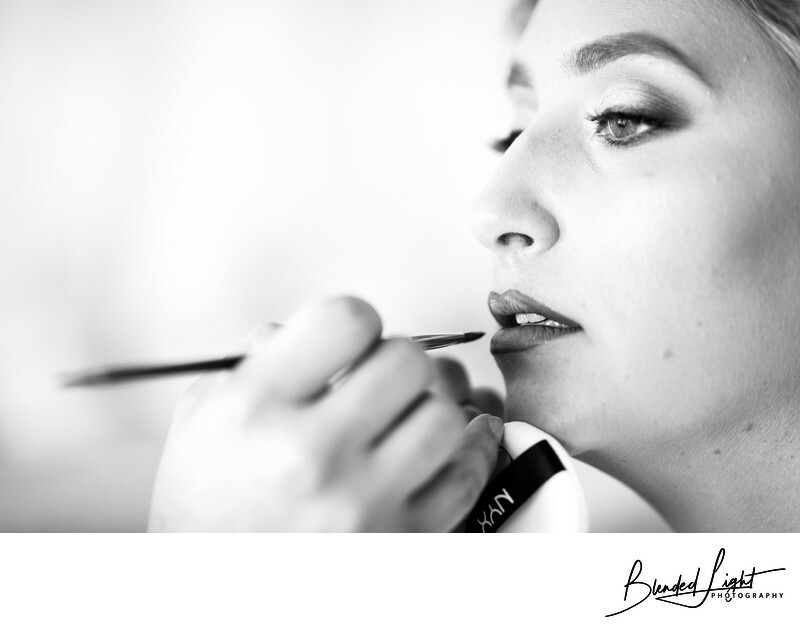 You can feel her thinking about holding still for her makeup artist, the seriousness of her ceremony and the couple's eventful reception. This cold, windy day in Wilmington was well spent with this gorgeous bride, the groom and all their loving family and friends that truly supported them and made their wedding day special and unique. While the interior of the venue is exceptional, what lies outside might truly be the mark of the venue's greatness. On one side you have the boardwalk against the Cape Fear River. Lined with tall curved street lamps and black rail fencing, this is a wonderful location for those stunning sunset images! And, as an added bonus, the USS North Carolina can be seen in the background! On the other side, you have the charming downtown area of Wilmington. The streets with brick pavers are lined with small town bustling stores and alleyways, making for great and simple locations for your couples portraits. While the daylight and sunset views are stunning, the night time offers ample opportunity to get creative. Whether you look for dark alleys with single light sources or choose to use one the well-lit brick or painted walls, you're sure to find something that will allow you some fantastic nighttime images. If you have selected Wilmington as you place to get married, you are going to be blessed with ample opportunity for some gorgeous photography. I'd love to chat with you about your day, so contact me to schedule a time! Location: The River Room, Wilmington, NC. 1/160; f/2.0; ISO 160; 85.0 mm.